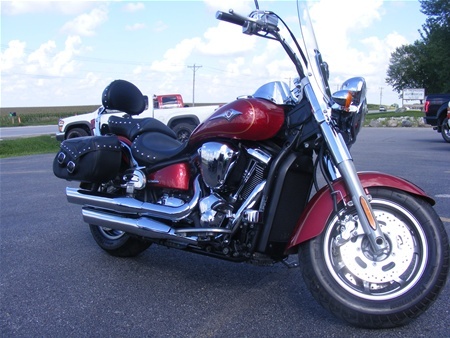 With a windshield, saddle bags and a passenger backrest already mounted, this Vulcan 2000 is ready for any trip! This Vulcan is in immaculate shape and has only 8,362 miles! The massive power of this bike is matched only by the massive amount of style this bike has, so take this Kawasaki home and let it put a massive smile on your face! We will accept trades, and also offer low-rate, low-payment financing! Perfect combination of power, performance...and modified individuality. 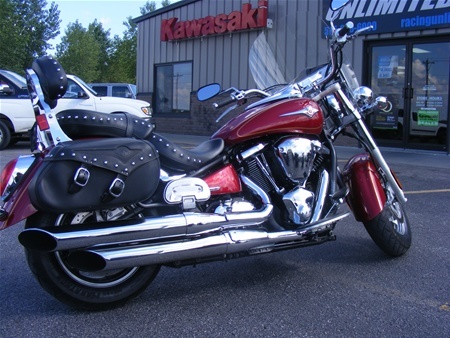 For the 2006 model year, Kawasaki has spread its wings in the big-bore V-twin cruiser arena by adding two more unique versions of its Vulcan® 2000 to the growing line-up of cruisers populating America's back roads and highways. 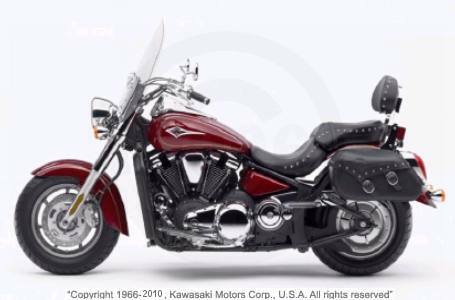 The Vulcan® 2000 Classic LT is the one that responds to consumer interest in an off-the-showroom floor dressed up cruiser—one that comes with accessories designed to compliment the overall 2000 styling, yet adding a flavor all its own. The Vulcan 2000 Classic LT will make its mark with those more interested in weekend jaunts than simply getting back and forth to work. It will help Kawasaki further establish its dealer showrooms as the place for big bike motorcyclists to do their shopping. And more than anything, it will marry the performance inherent in the 2,053cc family of top-of-the-line cruisers with Kawasaki's own take on individualized styling. While it comes with special accessories as part of the package, this motorcycle is eminently slated to be further customized by its purchasers. And the company's broad offering of accessories will give owners of this new entry every opportunity to do just that. The accessories coming standard with this new, stylish cruiser are saddlebags, passenger floorboards, passenger backrest, and a windshield. The bags are constructed of reinforced top grain cowhide (selected with minimal flaws and deep dyed so the finish won't scrape off), and are highlighted by chrome plated brass stud accents on the bag lids, a slant top opening on the lid which is fastened with two 1.5-inch wide leather straps featuring chrome buckles and quick release stealth fasteners. To protect the contents from moisture getting into the bags, the rolled and riveted top lid minimizes water entry. A metal-reinforced upper edge keeps the bags holding their shape, while they hold the rider's gear. Chrome plated brass studs adorn the special seat and match those attached to both the bags and the passenger backrest. Together, they provide a styling line both attractive and distinctive. The backrest is a classic new style that takes both visual appearance and comfort into consideration. The adjustable height windshield is made of thick, optically correct acrylic plastic and is shaped for smooth airflow and classic cruiser style. Power for this stylish cruiser comes from a massive V-twin engine featuring a bore and stroke of 103 x 123.2mm, forged pistons, alloy-steel connecting rods, huge 220mm flywheels, dual cams located within the one-piece crankcase and right-side pushrods actuating four valves per cylinder. 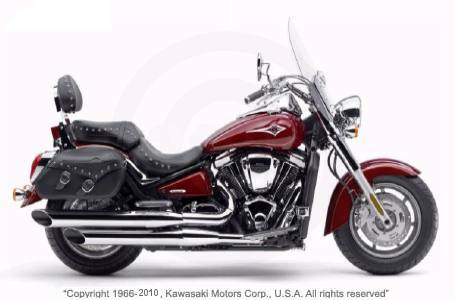 Notably, Kawasaki engineers chose to utilize a push rod design in order to reduce engine height, which directly contributes to the Vulcan 2000 Classic LT's low center of gravity and relatively low seat height. Plus, hydraulic valve lash adjusters automatically maintain zero valve clearance for smoother, quieter operation. 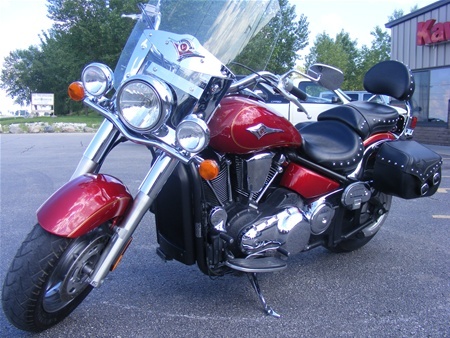 Cruiser fans will appreciate the Vulcan 2000 Classic LT's V-twin sound thanks, in part, to the single-pin crankshaft, while dual counterbalancers and rubber engine mounts keep it running smoothly. To provide sharp throttle response at any rpm, the Vulcan 2000's electronic engine control unit (ECU) manages electronic fuel injection with its dual 46mm throttle bodies and sub throttle valves, as well as the iridium spark plug ignition system. The sub throttle valves provide the Vulcan 2000 Classic LT with smooth throttle response, while the highly sophisticated fuel injection system's fine atomizing injectors deliver an ultra-fine mist of fuel/air mixture to the cylinders for greater combustion efficiency, increased power and optimum fuel economy. The top quarter of the V-twin engine is liquid cooled, while temperatures for the bottom three-quarters of the engine are managed by stylish and highly functional cooling fins. Plus, the engine and transmission feature built-in oil and water pumps, with the transmission also serving as the oil tank. The chrome air cleaner cover is nestled between the cylinders, which feature a black matte finish, and the cooling fins are polished to a bright metallic shine. 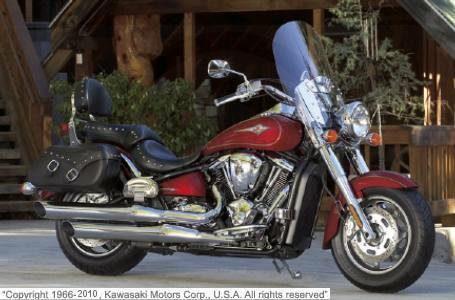 Dual exhaust pipes and mufflers emit a distinctive V-twin rumble, and include honeycomb catalyzers to reduce emissions. A Hyvo primary drive chain transfers torque from the big V-twin engine to the five-speed transmission case, which houses a multi-plate wet clutch. To fully benefit from the Vulcan 2000 Classic LT's advanced electronics, a gear position sensor in the transmission sends signals to the ECU, further enhancing fuel injection volume and ignition timing, and thus improving performance. Final drive to the rear wheel is provided by smooth, quiet and low maintenance belt drive. The V-twin engine is utilized as a member of the Vulcan's steel, double-cradle frame, which features a large-diameter, box-section single-tube backbone. Coupled to the frame is a simple but elegant rear steel tube swingarm suspension with a direct-action single shock. The rear suspension provides 3.9 inches of travel, and includes spring preload and rebound adjustment. Up front, large 49mm forks provide precise steering feedback and 5.9 inches of travel. 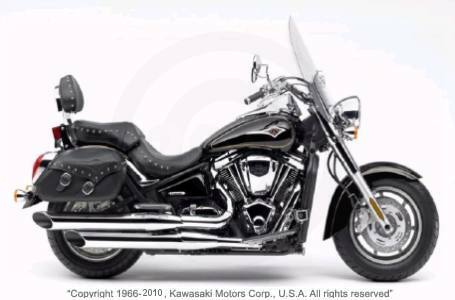 Styling queues that put the Vulcan 2000 Classic LT at the forefront of cruiser design include a bullet-style headlight. Adding to its high-end status is the chrome instrument panel with its large-face speedometer; mounted on a stretched, 5.5-gallon fuel tank, the V-shaped panel keeps the rider informed with an LCD display and warning lamps. 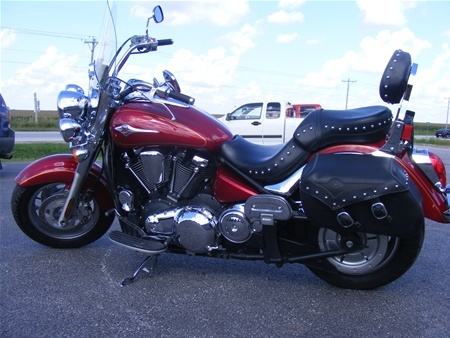 This Vulcan motorcycle rides on bright, cast aluminum 16-inch wheels with a 150/80 front radial tire and a huge, 200/60 rear radial tire – the biggest stock rear tire on a production V-twin cruiser. Dual 300mm front disc brakes with four-piston calipers and a single rear disc brake with two-piston caliper bring this big cruiser to smooth, powerful stops. Authentic Kawasaki Accessories are available through Kawasaki dealers or they can be purchased on the Internet at www kawasaki.com. Single Shock, 8-Way Rebound Damping, 3.9 in.